Google recently announced an addition of a new building to its Cambridge, MA campus. Long known as a great place to work, much of what attracts people to Google is their culture and workspace concepts. 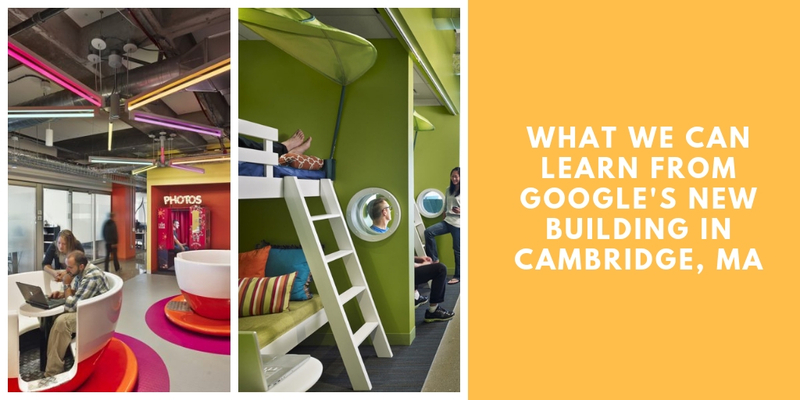 What can we learn from Google’s new office building in Cambridge MA? And how can commercial real estate landlords use this to better improve their own properties? Take a peek into any of Google’s offices and you won’t find stuffy cubicles. Instead, you’re more likely to find putting greens, hammocks, and bunk beds. They blend in work and play into fun concepts throughout their buildings. Who wouldn’t want to work in a place like that? Another common theme for Google campuses is the inclusion of on-site services. You can find anything from coffee shops to massage rooms and fitness classes. Google buildings are more like little communities than offices. You need not go off-site to access services required throughout the workday. Everything is designed to keep you on-campus, engaging and interacting with other members of the company. Another common element for Google workplace design is the infusion of natural light and bright/cheery colors. It has long been known that colors and light impact moods. It can make you feel happy, calm, energized, excited, etc. Incorporating this into office space design can make workers happier and more productive. As you look at the different elements of Google office space designs, you can’t help but notice the focus on health and wellness. Their offices are not solely about sitting at a computer and getting work done. Their building designs, features, and amenities allow their employees to balance work with wellness, which is an important lesson to learn. Google is changing the very definition of office space. In doing so, they manage to attract/retain talent and maximize productivity. Commercial real estate landlords can learn a lot from this. Implementing some of these concepts can enable commercial real estate landlords to differentiate themselves from the competition, attract modern tenants, and stay ahead of changing markets.